"Secure the shadow before it fades ..."
Editor’s note: Death as a part of life is a theme previously covered by the Chronicle in the form of a column by Jo Mathis: “Letting Go: Many ways to say good-bye to a loved one after death.” And the topic surfaced tangentially at a recent forum for candidates in the Democratic primary for the state House, when they were asked to comment on a state law requiring death certificates to be signed by a funeral director. 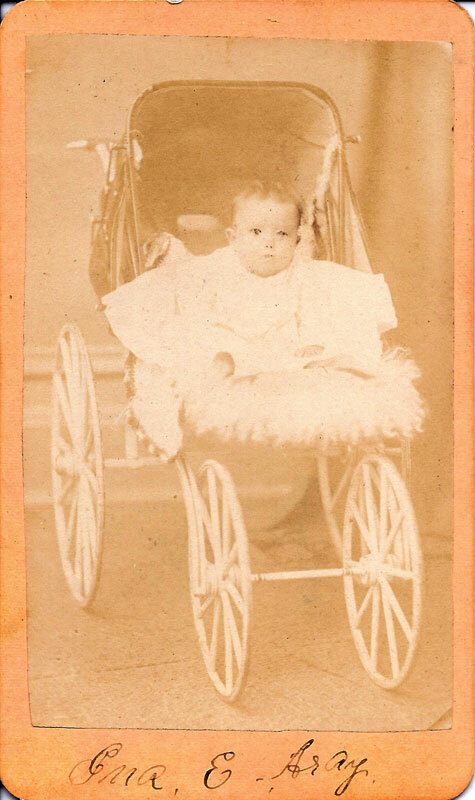 In her regular local history column for The Ann Arbor Chronicle, Laura Bien takes a look at the role photography played over 100 years ago in documenting the deaths of children. It was an era without personal cameras, much less digital memory cards storing thousands of shots. The 19th- and early 20th-century family photo albums in the Ypsilanti Archives often contain only one expensive formal studio portrait of each individual family member, or a single economical group portrait. Child mortality was high. 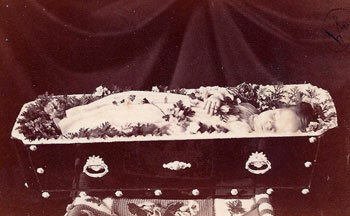 When a child or other family member died, families would on occasion arrange to have a photograph taken before burial. Sometimes it was the first and last photograph they would ever possess of their loved one. 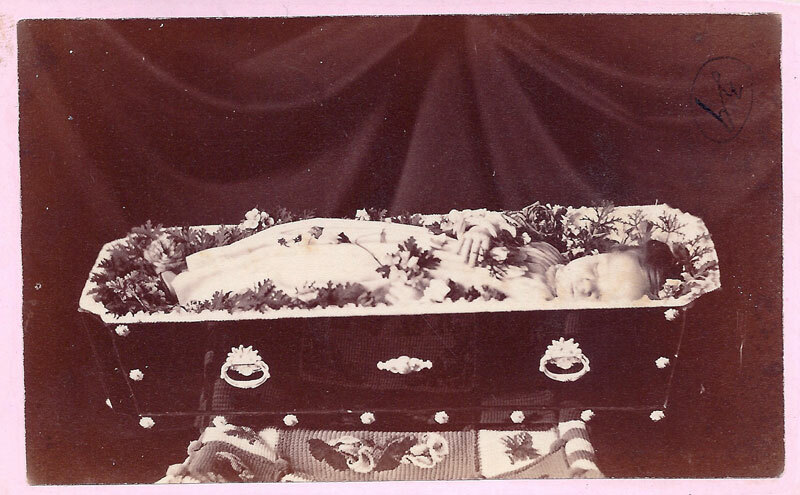 The fifty-odd family photo albums in the Ypsilanti Archives contain about a dozen examples of these poignant memento mori. Theodore W. Babbitt was born to 37-year-old Judge John Willard Babbitt and his wife, 26-year-old antique collector Florence Smalley Babbitt on June 7, 1874. The couple already had two daughters, 4-year-old Elonora and nearly 2-year-old Alice. The Babbitts lived in a large home on South Huron street. Florence had seven children, of whom four survived. 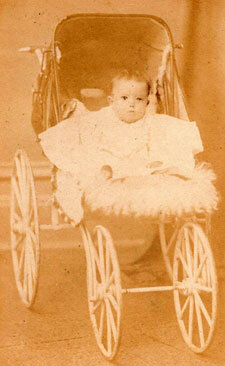 Theodore died when he was less than a year old. Theodore was buried in Highland Cemetery in the Babbitt family plot. His badly eroded gravestone bears a sleeping lamb on top, a symbol denoting the death of a child. 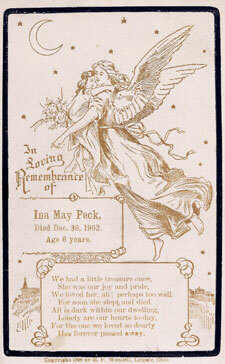 Ina May Peck died of pneumonia on the last day of 1902 after falling sick on Christmas. The Babbitts were friends with one of the oldest families in town, the Pecks. Seven months before her death, Florence Babbitt found she shared a connection with one of the Peck children. On March 20, 1929, Florence Babbitt wrote a letter to Dwight Peck. “I used to hold you on my lap when you were a baby but I did not know our birthdays came on the same day,” she began, going on to reminisce. In addition to a March 20 birthday, they shared another commonality. Like Florence, Dwight and his wife had lost a child. 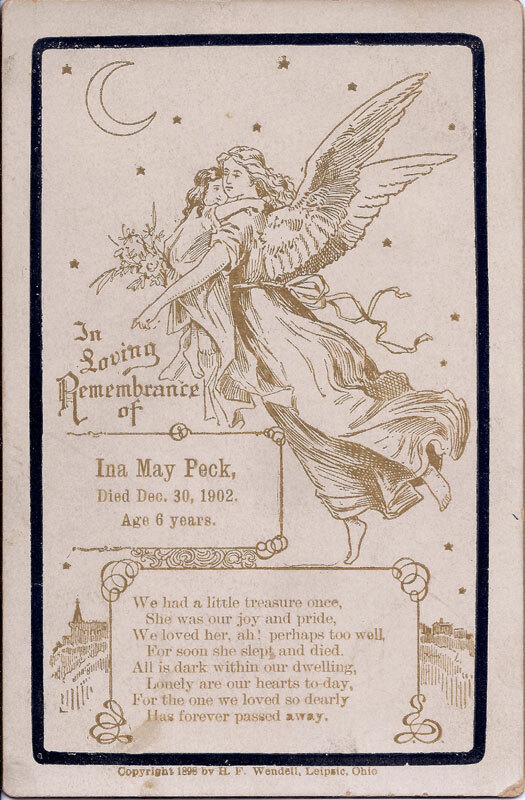 Ina May Peck died of pneumonia on the last day of 1902 after falling sick on Christmas. She was 6 years old. The family, who lived at 117 Forest Avenue, printed memorial cards to distribute to friends. In contrast to the usual gold-on-black card, Ina’s shows gold lettering on a cream background. The card’s date of death is one day earlier than that on her death certificate; perhaps Ina passed away during the night, as the rest of the city prepared to celebrate New Year’s Eve. 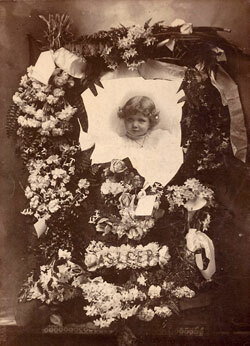 Ina’s memorial photograph is a photo-montage of a portrait combined with a memorial floral display. Portraying the dead as sleeping in memorial photographs was common, according to San Jose State University art and design professor Brian Taylor, a history of photography expert. “[There are] many, many images of dead people appearing asleep – so many that there is an entire genre of’ ‘sleeping baby’ pictures,” he wrote in a personal email. An example of this genre from the Ypsilanti Archives is one unlabeled photo from the Aray family album. The photo appears to have been taken at home. The child’s sunken eyes, limp hands, and unusual posture indicate that this is not a conventional portrait. 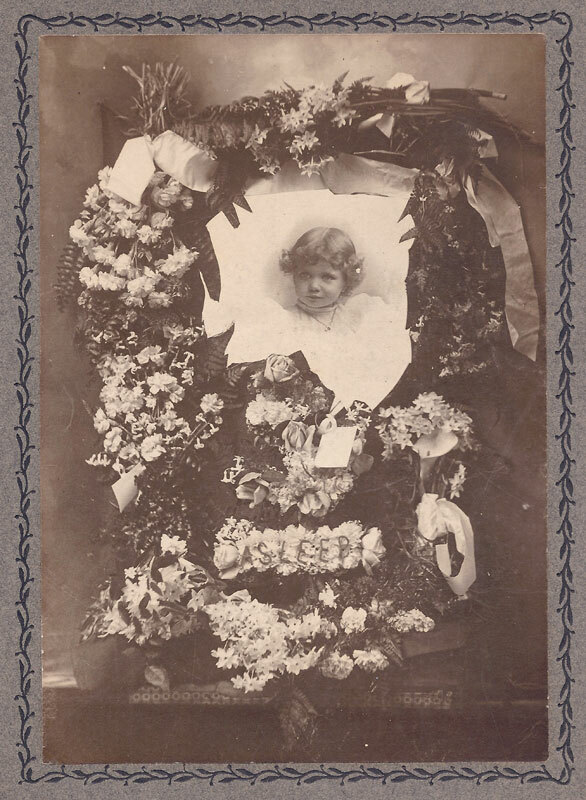 It may be that, as with a few memorial photographs, the child was still alive but deathly ill and the family wished to capture a living likeness before the inevitable. An unlabeled photo from the Aray family album. 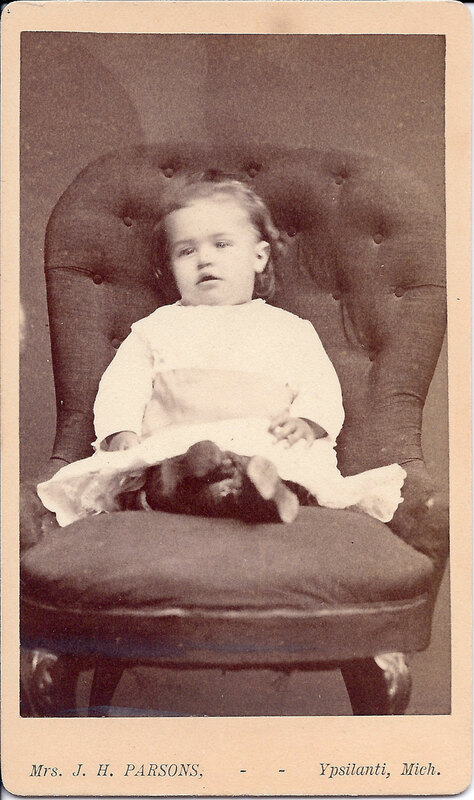 Another probable example of this genre is a photo of V. Mabel Crittenden, infant daughter of Newton and Emily Crittenden. 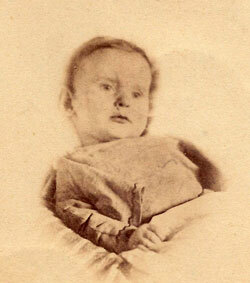 The ten-month-old child died on Aug. 21, 1869. 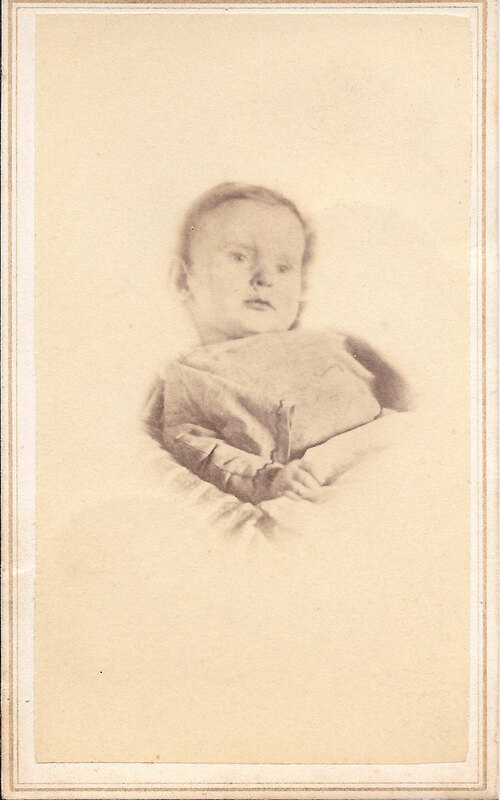 V. Mabel Crittenden, infant daughter of Newton and Emily Crittenden. 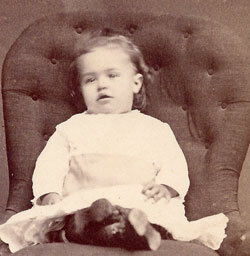 Sometimes deceased children were posed as if sitting. A photograph of Maggie Shiers may be such an example. Born in 1879, Maggie was the daughter of Methodist preacher Daniel Shiers and his wife Ida. She was the second of the couple’s children to die young; Maggie’s brother Charles, born in 1874, had died in 1877. 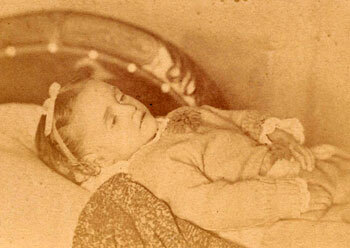 Maggie passed away in 1882 just over age 2. Two years later, her brother Harold was born. He died the same year. Ida ultimately had six children, three of whom survived. In the Aray album, a second probable example of posed memorial photography appears. It is a portrait of Ina Estelle Aray, born March 13, 1873 to Eglon and Alice Aray, descendants of one of Washtenaw County’s first settlers. A hint in this photo is the photographer’s retouching of the baby’s eyes. In some memorial photographs, pupils were painted on closed eyes for a more lifelike appearance. In others, retouching achieved the same purpose. Retouched eyes are not an infallible sign of a memorial photograph. In a long-exposure photograph, motion of the eyes could result in blurred and indistinct eyes that were occasionally retouched. Ina Estelle Aray died in June of 1874, just over a year old. The family was spending the summer in St. John’s, Michigan, just north of Lansing. A month after Ina’s death, Eglon and Alice wrote a joint letter home to their relatives. Alice’s portion, with her spelling and punctuation preserved, serves as the last comment on the onetime prevalence of memorial photography. I wish Eglon and I could come home and Eva is so lonely without little Ina she used to tend her so much she would draw the [wagon] and get her to sleep every day and take her hand and lead her out to see the chickens and now she don’t want to play for she has no little sister to play with – oh Mother we don’t know how much we love our children till they are taken from us give my love to everybody. Last column’s Mystery Artifact proved to be no mystery for cmadler, Dave, and Alice Ralph, the latter of whom noted, “The mystery object is no mystery in southern Maryland or tidewater areas. It is a plate for serving oysters, of course.” Of course! This week’s artifact is a recent Ypsilanti Museum acquisition currently in storage until someone figures out what the heck to do w…er, excuse me, I mean until an appropriate display showcase is arranged. A bit over a foot wide, it consists of a platform supported on three legs. Take your best guess and good luck! My first guess is that it’s an early cast-iron skillet. I say early because of the three legs, which suggests that it might have been intended for cooking over a fire rather than on a level oven. The protuberances on each side look slightly broken; perhaps they originally had holes allowing this to be suspended above the hearth. Since there are two, rather than three, this could not be hung in a stable (level) manner, and so I’d guess that it would not be hung for cooking purposes, but perhaps only for storage. Or perhaps it is a trivet used to hold hot objects like irons (that were heated on the stove). cmadler: Yep, one of the protuberances is indeed broken; originally it was an extended lip with a hole, like the other side. Though how you can break cast iron is beyond me. I’ve actually broken a cast-iron pan myself. I don’t know how, it just broke as I was putting it away one day. Maybe it was weakened by rust or something. It might have been a warming tray? Cast-iron retains heat, so if this was heated it could then be placed on (or near) a table, and dishes that needed to be kept hot could be placed atop it. cmadler: Hmm, weird. I’ve heard cast iron can be brittle at times. Personally I have a cast iron Dutch oven and three variously sized pans that I love and cook in all the time…all salvaged from thrift shops and seasoned to a rich glossy black; my favorite cookware. cmadler: Warming tray is a great guess. But the platform is fairly thin…hmm, perhaps it would lose heat fairly quickly. Another possibility: Méliès was going to make a film of Wells’ “The War of the Worlds” but gave up when he saw this model for the tripods. cmadler: Whoopsie, I didn’t see a model for the tripods at that Wikip. link…was there another link you were thinking of? There is an entire book called “Wisconsin Death Trip” that is full of photos and news stories like the ones above…. the most unusual photos feature the deceased propped up amidst all of the living family members. It wasn’t only children photographed after death; there were many middle-aged and elderly photographed as well. Julie: Absolutely you are correct; there were many adults thus photographed. Turns out our archives emphasizes children in these photos. I did see a “maybe” adult photo but it didn’t make it into the article. Have a copy of Wisconsin Death Trip–it’s an extraordinary book, quite revelatory. After heating it in a fire, one would pour water on it. The thin layer of water would steam quickly, allowing this to operate as an early humidifier. I’m gonna guess a griddle meant to be used in open-hearth cooking. I am going to guess that it is a crepe pan. I looks like it would do the job well; a slight lip to work the batter to and held up a little off the stove to not let things burn. abc: Interesting guess…we shall see. Sorry if I’m not verbose Laura, dead babies leave me speechless. I would guess the protrusions held a wire rod for a handle (now lost) with wire or wicker wrapped around the middle for a grip. The thickness is to diffuse the heat from a flame, you could use this griddle on a modern gas stove with fine results. Crepe pans on the other hand, usually have a rounded surface which is dipped in batter to keep the crepe thin, with the flat part going over the heat source. Cosmonicon: Oh, no worries, please–sometimes intent is lost in mere text and I certainly did not mean to imply you were not “verbose enough” and I apologize if I unwittingly did…I’m still recovering/exhaling myself from a week of looking at these pictures. Thanks for your thoughts on the M.A. These photos remind me that the Victorians also liked to keep ornaments made of the hair from the dead. I would encourage people who hadn’t read the former Chronicle article cited in the introduction (“Letting Go”) to do so. I heard Ms. Rush speak at the last Ann Arbor Ignite speaking event, and I was very moved by her insights. LiberalNimby: That was a good recommendation and a good article, which I hadn’t read yet before you mentioned it. Thank you for the recommendation. Cast iron is very brittle compared to steel. The higher carbon content gives it a lower melting point, which makes it easier to cast, hence the name. More carbon also make it more resistant to rust and gives it good compression strength. But ductility goes out the window and you can easily break it. That is interesting, Jim; didn’t know that. Thanks for the info. Cast iron is very brittle and breaks! My woodburning stove had several pieces broken on it when I bought it. It is hard to repair once this happens but we found a welder who did it. Speaking of “going out the window”, I used to throw broken cast iron pots and pans out of the 2nd floor window to break them and bury the parts in my yard under our, now “gone but not forgotten” camper down elm, that needed as much iron as possible. I have always cooked on cast iron. I agree that this is probably an early pan made for using over a fire and perhaps something of a frying pan (hoe cakes, etc.) that could also be used to heat irons if one did not have a wood or coal stove. I had to Google “camperdown elm” but was fascinated to learn that every specimen of this tree, which cannot reproduce itself, is a cutting going back to one original cultivar created by a Scottish botanist working for the Earl of Camperdown around 1835 or ’40. Okay, Laura, give. What was the function of the artifact? I think you’ve collected all the guesses you are going to get. Vivienne: You are right; I’ve collected all the guesses I’m likely to get. Tragically, the revelation of this Mystery Artifact will have to wait till my next column, published under the beneficent auspices of the Ann Arbor Chronicle on Wednesday, July 28. 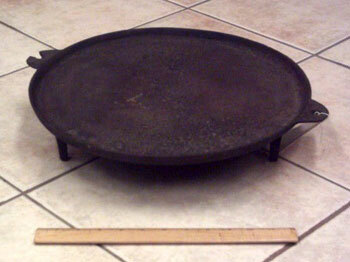 Pancake griddle is my guess, for over a wood stove or hearth. My daughter and I agree that this was a grill for use on a wood or charcoal fire, sort of a campfire grill.